CENTRAL DISTRICT, Seidaikei - The Ist Federal Assembly of the Daikoku Federation has met for its first session in Central District, Seidaikei, the capital of the nation, on Friday. The Co-Presidents of the Daikoku Federation, Migs Caldeo and Karlos Luis Mozo Anioay, opened the first session. The Ist Federal Assembly of the Daikoku Federation successfully approved the re-appointment of Deputy Patrick Xavier Silerio of the Principality of Treisia to the office of Premier of the Daikoku Federation. NAKATANI, DPR of Urbonia - The Central Committee of the People's Party of Urbonia has unveiled on Wednesday evening the newly adopted party logo. The new party logo of the People's Party of Urbonia consists of the hammer, brush and sickle in a red field with the name of the political party below. CENTRAL DISTRICT, Seidaikei - The Presidency of the Daikoku Federation issued a decree on Tuesday evening which introduced new state symbols for the constituent state of the Democratic People's Republic of Urbonia. The new state emblem of the Democratic People's Republic of Urbonia - It consists of a hammer, brush and sickle in a red field, bordered by a ring of rye with ribbons consisting of the colors of the flag of Urbonia and the Daikoku Federation. The new motto of the Democratic People's Republic of Urbonia - "Our Own Way, Our Own Strength." Full text of decree available below. 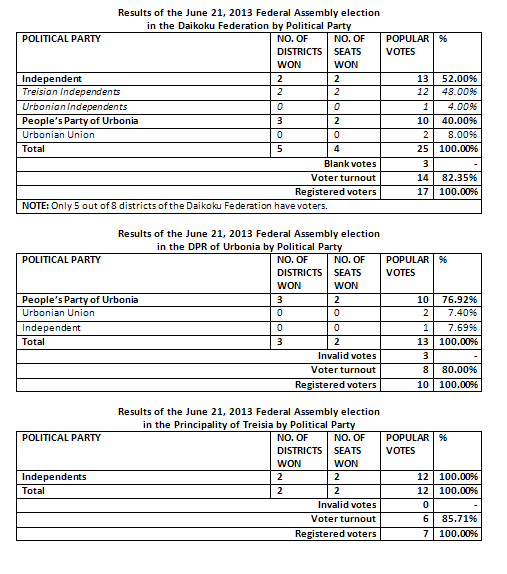 CENTRAL DISTRICT, Seidaikei - The Presidency of the Daikoku Federation has published the returns for the election to the Ist Federal Assembly of the Daikoku Federation held on Friday. CENTRAL DISTRICT, Seidaikei - The election to the Ist Federal Assembly of the Daikoku Federation were successfully held on Friday. The Presidency of the Daikoku Federation reported that 82 percent of the voters, or 14 out of 17 citizens, participated in the elections. 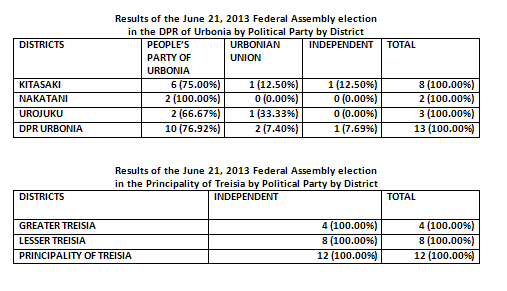 According to election results published by the Presidency, the People's Party of Urbonia won all seats provided in the constituent state of Urbonia with 77 percent of the votes, while all candidates endorsed by Co-President Karlos Luis Mozo Anioay in the Principality of Treisia, all running unopposed, won all seats provided in the constituent state of Treisia with 100 percent of the votes. The elections were reported to have been conducted without any major problems in any of the two constituent states of the federation. With the election of the deputies of the Ist Federal Assembly, they are to meet for their first meeting on June 27, 2013. They are expected to choose the Premier of the Daikoku Federation. 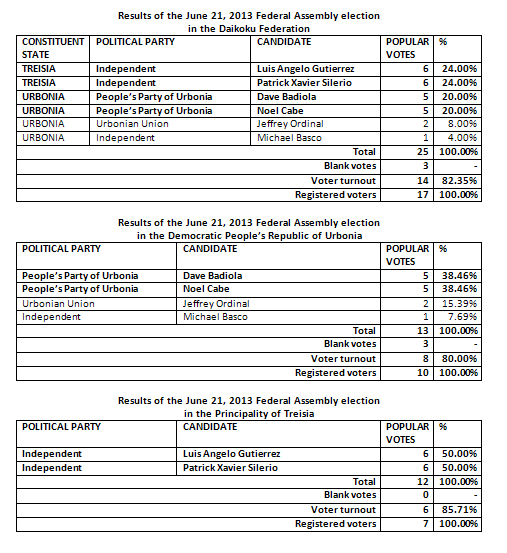 CENTRAL DISTRICT, Seidaikei - The period for the registration of candidates to the election to the 1st Federal Assembly ended with the approval of the Presidency of the Daikoku Federation of the candidacy of two candidates in the Principality of Treisia through a decree on Thursday morning. CENTRAL DISTRICT, Seidaikei - The Presidency of the Daikoku Federation issued a decree on Sunday afternoon which approved one candidate from the constituent state of the Democratic People's Republic of Urbonia in the election for the Ist Federal Assembly. CENTRAL DISTRICT, Seidaikei - The Presidency of the Daikoku Federation released a decree Sunday afternoon which postponed the election of the Ist Federal Assembly to June 21, 2013. The Presidency cited that it needed more time to finalize candidacies and to prepare election materials as the reason for the postponement of the elections. CENTRAL DISTRICT, Seidaikei - The Presidency of the Daikoku Federation has amended the decree "On the Election to the 1st Federal Assembly" on Saturday evening. The amendment to the decree included the changing of the number of deputies required to be elected, and the extension of candidate registration period.